The Benefits of Using Professional Musicians on Your Big Day. You’ve set the date and chosen the venue. Next, you want to start looking at the suppliers. And of course, the dress for the Bride. There’s lots to do, so consider hiring a Wedding Planner. If you don’t want to do that, or maybe don’t have the funds, then there are lots of websites with guides, like Hitched.co.uk. There are also free wedding planning tools. At some point (and we’d suggest earlier, rather than later), you will need to think about entertainment. Although some couples just have a friend who likes to DJ or has an amateur band, we think this is usually wrong. I mean I have friends who wear great suits, but I wasn’t going to try and borrow one for my own wedding! The difference between professionals and amateurs is huge. When you have a friend that takes nice photos as a hobby, that’s great. But when you have a wedding photographer that has photographed loads of weddings, you get true quality. Also, wouldn’t you rather your friend was there just as a guest? He or she will take lots of photos anyway, so you’ll get lots of variety. The same can be said of musicians. When we hire our bands and DJs, as well as our string groups, we frequently get a fantastic response. 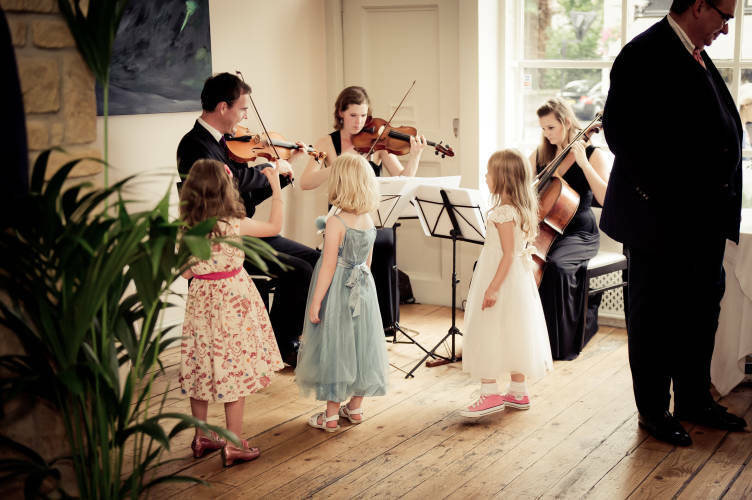 Sometimes we get an enquiry for a string trio for a London wedding, or a quartet enquiry. Then later the client changes their mind. ‘One of our friends knows someone who plays in an amateur string quartet’. Well that will definitely save money, but if you spend a bit more, you’ll get a wedding string trio or quartet who will make an impression. They will sound more impressive and will have much more great music available. Contact us here at Liquid Strings and let us provide you with the services of a brilliant wedding string trio – and maybe a wedding music live band or DJ too.